Until his move to Central Florida in 1998, Milton Heiberg was a New York City-based photographer working from his studio in midtown Manhattan. He began both his photographic and naturalist careers at age eight with a love of nature and a Kodak Brownie-Target box camera, and has been a tree hugging shutter-bug ever since. He was educated at New York University and Cornell University—Graduate School of Biological Sciences, with further studies in ornithology at Rutgers University. Thousands of his photographs have appeared in books and magazines published by HarperCollins, Harcourt-Brace-Jovanovich, Macmillan, McGraw-Hill, Time-Warner, National Audubon Society, and National Geographic Society, among many others. His photographs have also been exhibited at places such as International Center for Photography—New York City, McGraw-Hill Building—New York City, Gray Advertising—New York City, and The Israel Museum-Jerusalem, Israel. 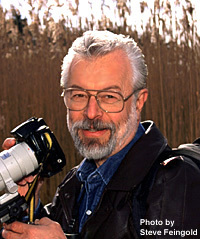 Milton has written seven books and numerous articles on photography. The most recent is The Essentials of Nature Photography, Tern Book Company—a complete handbook of nature photography. He is the founder of the Photo Committee at the New York City Audubon Society and served for four years on their Board of Directors. He has taught nature photography courses at New York City Audubon Society and various other institutions within New York City from 1980 until he moved to Orlando, Florida. He currently works out of his studio in Orlando, and teaches nature photography at the Crealdé School of Art, Winter Park, and at DPA (Digital Photo Academy—Panasonic/Lumix's national school of photography) as Central Florida's photo instructor. He is also currently serving on the Board of Directors of the Orange Audubon Society. For MCH Montessori Children's House contact sheets CLICK HERE. If you would like to Know more about the Heiberg's, CLICK HERE. For the Heiberg coat of arms, CLICK HERE.